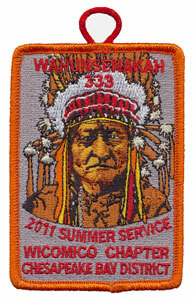 Wahunsenakah Lodge held their 2011 Summer Service at Bayport Scout Reservation on Sept. 15-17, issuing the rectangular pocket patch with loop pictured above. The patch was designed by the Lodge Insignia Design Committee and features a Native American Chief, the totem of Wicomico Chapter which serves the Chesapeake Bay District of the Colonial Virginia Council. The Arrowmen of Wahunsenakah Lodge had plenty of work to accomplish in their efforts to help the camp recover from the recent destruction left by Hurricane Irene. You can view all of the event issues of Wahunsenakah Lodge since it's inception in 1996 here.